Russell Performance Proclassic Hose Ends and Adapter Fittings Speak For Themselves. 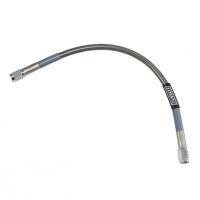 Russell 24" DOT Brake Hose 3 AN 90 Degr.to 3 AN Str. Pit Stop USA is The Online Motorsports Superstore! Russell Performance Proclassic Products Speak For Themselves! Russell Proclassic Hoses feature a lightweight nylon fiber outer braid over a durable rubber core with a maximum pressure rating of 350 psi. It is capable of handling nearly every plumbing task on your car and is safe to use with fuel, oil, or antifreeze. A choice of matching black/silver anodized aluminum hose ends and black adapters is available to allow connection to most fuel pumps, carburetors, cooling system and oil lines. Russell Proclassic Full Flow Black Hose Ends and Russell Full Flow hose ends have been the choice of racing professionals for more than 30 years. Russell has expanded their line of adapters to provide the widest range of coverage for whatever plumbing problem you need to solve. Now you can order Russell adapter fittings and hose ends in the ProClassic finish. Whatever look you want, one of the Russell three corrosion-resistant finishes will meet your needs. Russell Proclassic Full Flow Black Adapters join Russell's wide variety of lightweight aluminum adapter fittings allow for the connection of Russell hose ends to almost any component. Russell adapters are offered in standard thread, metric thread and pipe thread to fit most popular oil pumps, fuel pumps, fuel filters plus a variety of other common components. Use Russell ProClassic adapter fittings to compliment the Russell ProClassic hoses and hose ends. We feature Russell Full Flow Hose Ends, Russell Full Flow Swivel NPT Hose Ends, Russell AN Fittings, Russell AN Adapters, Russell Carburetor Fuel Line Kits, Russell Competition Fuel Filters and Russell Speed Bleeders at low everyday prices.